Remember the old Mini Coopers? No, I wasn't driving then either. But they really upset the middle order, middle range, middle-of-the-road driving fraternities. You see most people couldn’t easily spot the difference between the nippy and the quick – and the quick ones ran rings round you. Fast Minis broke the Speed to Badge-Size Pecking Ratio (S B-S PR). Oh you know, that’s the ratio that ensures big saloons are best equipped with lots of toys and speed. They cost lots more so everyone can tell you can afford to spend it. Medium sized saloons are not quite so big or fast, and so on (just as long as you have the right badge on the front/rear ends as well). Well the Mini was way too fast and way too small with the wrong badge. So it broke the 'rules'. 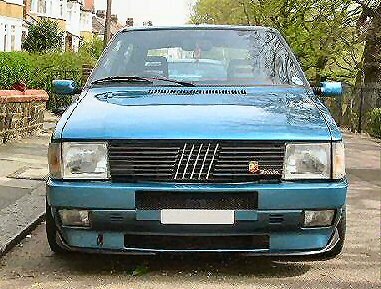 Well Fiat made another ‘hit’ little car in the eighties – the Uno – one of the ‘super minis’. We imported about 220,000 of them in the UK. What ‘they’ don’t often mention is that hidden away amongst these beloved shopping trolleys were some four thousand real road burners.... The Mark 1 and 2 Uno Turbos. Their effect even today is the same as the Mini Cooper & Cooper ‘S’ in the sixties. Yes you can spend a load of wonga extracting the last bhp from the Uno Turbos. But raise the boost on a Mark 1 to 1 bar, increase the fuelling to match, adjust the engine management map (all with under bonnet tweaks), use only Super-Unleaded, and only the deeply seriously modified and ‘super cars’ can catch you anyway. Yes there are quicker cars but not at this price -– and then there’s that shock factor to those Middle Order drivers ”but it’s an Uno”.. ah yes, and it’s fast disappearing up the outside lane of the motorway ahead of you. Unfortunately the bodywork often disappeared nearly as fast! The good news is that the Uno Turbos use the same shells as every other sort of Uno ever made - and all the body shells were stamped with all the options. So if you ever fancied a seriously quick classic little town car then reshelling the turbo components into another Uno is a real possibility. This year one visitor stood in the middle of an isle at the NEC Classic Car show by our SFC stand, right next to a Mark 1 Uno Turbo. “The best fun I ever had on four wheels, you know. This car does 145mph and gets there quickly” he exclaimed. I concur providing you keep the top speed test for the runways and track days you should love it! Lets take a more detailed look at this pocket rocket. Fiat commisioned the original Uno design from Giorgetto Giugiaro. A lot of detailed attention was given to the ergonomics of its interior, overall weight and drag factor (0.34 Cx). You'll find the dip/ main beam and wiper switches are unique - and take a bit of getting used to. The early models were released from January 1983 (after some production teathing problems), and included 3 petrol engines - the 903cc push rod (in the 45), 1116cc sohc (in the 55), and the 1301cc sohc (in the 70). Diesel (45D) and automatic versions (Uno-matic) followed. A further automatic system followed with Continuously Variable Transmission - eventually becoming the 'Selecta' version in 1987. This system used the 1116cc engine and was very expensive to repair. Consequently the light torque low chassis load of the Selecta made a good donor for re-shelling a Turbo. In mid 1985 a new 999cc FIRE engined model was introduced with the light and nimble 1 litre. A 60D 1367cc turbo diesel was introduced at the end of the year, with external trim very similar to the petrol turbo ie versions. A year later a 1498cc unit was introduced with electronic fuel injection and catalyst. This might be relevant to some race series - being the largest capacity Uno made. 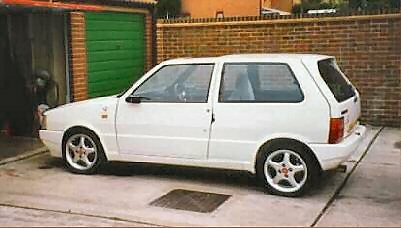 A second series of Uno was released in 1989 - commonly known as the Mk2 Uno. The body panels were revised to fit a new corporate look for the nineties - with slimmer headlights and grill, revised front wings and smoother tail gate. One of the effects was to further reduce the car's drag coefficient to 0.33. At the same time injection versions were available across most of the range - except for the 903cc. The 1108cc FIRE unit was introduced, replacing the 1116cc unit and a new 1372cc ie model introduced. In general the Uno's build quality was much improved in the Mk2. Its floor and sill panels were also galvanised. 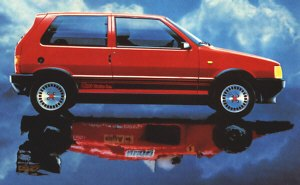 Italian production of the Uno ceased in 1995 with the introduction of the Punto. By then over 6 million had been made. Some forms of production did continue around the world up to 1999. In 1981/2 Fiat had formed a successful relationship with Warner-IHI of Japan in supplying an aftermarket turbo kit for the US 124 Spider market (Sold in the States by Legend Industries). And IHI were again used as consultants in development of the Uno Turbo. The first Uno Turbos were launched in April 1985. They were priced to compete with the Peugot 205 GTi and Renault 5 GT Turbo. The initial Uno Turbo Mk1 had a 1299cc engine and the first generation Bosch-Marelli engine management systems. If tuning is required these EMUs should be avoided. Amongst other things they were not specifically designed for unleaded fuel. (Note: regarding use of unleaded on the early cars... being turbos the engine and valve seats should take it but the exhaust manifold and down pipes won't. No doubt some of you guys can prove me wrong). The 1301cc version quickly replaced the 1299cc. On paper it generates the same max power (105bhp) in practice the 1301s are noticeably more spritely and torquey motors. The first generation EMUs continued to be used. (You can quickly spot them by the white sticker on the box at the back of the engine bay). On later EMUs the sticker background colour changes to red, green then black. The 1301cc Turbo was replaced by the 1372cc unit in 1989 with the introduction of the Mk2 Uno Turbo. For some markets the 1301cc turbo was retained in the new shell until a catalysed version was available. The changes to the car were essentially cosmetic - with the front wings and bonnet, tail gate and external trim reworked to provide a different look. Weight was introduced in the cabin with different trim and more features and sophistication. In the UK the Mk2 Uno T never achieved the same popularity as the Mk1. Its heavier, with a bigger engine capacity and turbo, but lacks the raw tuning potential in the high revving Mk1. Actually the bottom end of the mark 2 engine and crankshaft is probably superior. But the Mark 1 head and plenum are better for tuning (the mk1 plenum can be dismantled for easier access). And the mk2 turbo is set at 0.7bar in comparison to the 0.6 bar of the Mark 1. All this changes when the mods start anyhow. 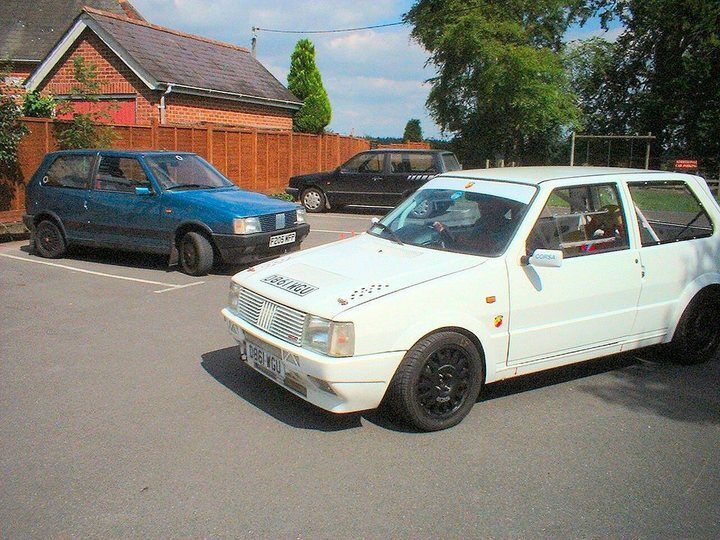 The Mk1 turbo is smaller and spins up faster with less lag. The Mk2 turbo can flow more air and is cheaper to have re built. The Mk1 delivers its turbo boost higher up the rev range while the Mk2 is more progressive - Mk2 turbo boost is present across more of the rev range. The Mk2 has 11bhp at max power over the Mk1 but the Mk 2 is also 80kg heavier. The Mk 1 torque curve also has a better mid range to it. Don't believe the top speed figures too much - especially if the car is slightly modified - as then a good one will pull to its red line in fifth (something the standard cars are reluctant to do). Orange-lining in fifth is more like 132mph and red lining 140mph! If you are modifying the engine but retaining many standard parts, the Mk1 has proved to be more reliable and can benefit from the Mk2s camshaft and higher valve lift. Best of the standard camshafts for the road is probably the Punto GT. While the standard X1/9 1498cc cam has the highest valve lift at 9.85(in) and 9.9(ex) its timing - 24/68 68/24 is different to the turbo cams and can deliver power advantages higher up the rev range. Reports from members (typically in motorsport applications) suggest the X1/9 camshaft may also be limiting valve/ engine life. Why does the 1.0 bar mod do more for the Mk1? Well the Mk2 is already nearer this point as it runs slightly higher boost as standard. Take a long look at the selling owner and how the car has been used and maintained. The Uno Turbo has a small capacity high performance engine, and for turbo reliability it needs regular engine oil changes with high quality oil. Because the cars are now inexpensive and easy to tune badly they are prone to what I would describe as 'slash and burn' owners - who buy as cheap as possible and consume the car with as little spent as possible. Unfortunately these Fiat sohc engines will take a lot of this sort of abuse without necessarily showing immediate signs of damage. Scrutinise the bills with care. If bills are not available expect the worst. The engine oil should be changed when it has been blackened with carbon deposits. Typically at three to four thousand miles. A good semi-synthetic oil is best - note not a fully synthetic unless the engine has just been fully rebuilt (new shells etc). After about 20,000 miles the semi-synthetics provide the best of both worlds for the engine and turbo. Some club cars on this oil change regime have turbos showing no visible problems with over 90,000 miles use. I would expect the reliable life of engine and turbo to be about 120,000 miles anything more than this is a bonus. The turbo needs to be carefully inspected. Look for white smoke from the exhaust when cold, and blue smoke on overrun when warm as signs of worn seals. The IHI needs to be competely rebuilt (£400) each time while the Garrett has less expensive parts, and the turbo specialist should be able to offer you a range of rebuild options for about £300. Hybrid turbine and turbo body options are available - but are not the first thing to do on a tuning list. If the car has been standing for some time then the seals can be gently run back to better operation - so then a little smoke may be tolerated. Make sure the turbo is receiving a full flow of coolant and oil by inspecting the header tank and oil supply pipes. Once warmed up the Mk1 turbo has a crisp note that rises and falls without hesitation. Any resistance in the turbo bearing (for instance from oil deposit fouling) can be detected as a stuttering or sluggish change in note, often accompanied by a low background hiss by the turbo. Weak link in the turbo system is the exhaust manifold and down pipe. The manifold itself is not ideally shaped for optimium power. Its shape is compromised by the close proximity of the cabin heater matrix and front bulkhead. But in addition the manifold is prone to cracking, especially if the wrong fuel, or fuel mix is lean, or higher boost is used. The turbo mounting itself is often cracked. Unfortunately something to be lived with until it leaks! Replacing the whole manifold with a stainless steel alternative is recommended but pricey. Closely inspect the oil cooler and its pipes, and the intercooler and its pipes. They are exposed at the front of the car just behind the front valence - check extra carefully if the car is lowered. Fuel pressure and injectors. A form of additional fuel regulator is worth considering to regularise the delivery pressure - particularly at higher boost. The pump itself is located forward of the rear axle, and should be checked for delivery and return. Budget to have the injectors cleaned and tested. Make sure the supply rail is not corroded. The turbo generates more heat in the cramped engine bay so suspect all the pipes and inspect accordingly. The inside of the small oil feed pipes can be subject to carbon deposit build ups from the oil. Check the underbonnet blanket too. Remove this and your bonnet paint job will fade within weeks! The Mk1 in particular can be prone to stretched throttle and snapping clutch cables. Make sure you have spares of both, and run the spares with a good high slip oil additive. Why some cars munch clutch cables when others don't is still a mystery. Cam belts change on purchase with a Fiat replacement - do not use cheaper motor factor alternatives. And then every 25,000 miles. Skimp on this one and you coud face a re-build bill. The two box exhaust system is heavy. Check the condition of the exhaust mounts and rubbers. The most common failure point for the system is the entry point into the second box - often due to poor alignment on fitting. Expect starter motors to go every 60-70,000 miles, and alternators every 80,000. Inspect the oil filler cap and the colour of the cam and valve gear visible underneath. If dark brown deposits are visible on everything expect and budget for the worst on the turbo (see above). Gearboxes are ok for reliability providing rock ape or racing changes to beat the synchro have not been employed. Rebuilds will start at about £700. Drive shafts and particularly the CV joint gaiters should be inspected. The CV and intermediate shaft bearings take a lot of torque and need to be in good condition. Check the radiator and header tank for leaks, and listen for the short burst fan cut in/out on idle when the engine is warm. A full seam inspection is needed from below – so get it on a professional garage ramp. If it gets damp long enough, the roof lining will part company from its backing, check this hasn’t begun… difficult to glue back. Check for bulging & partial detachment. - Seats & door cards the Recaro’s material looks warn after 40k difficult to get the black Fiat insignia cloth anywhere. - Check to ensure plastic push fit parts are present. - Check switch gear, switches and dash warning lights. - Controls and plastic items. Marginal but competent. Consider upgrade to 4 pot calipers if you are not considering concours. Bigger brakes and discs will mean bigger diameter rims and may need a different master cylinder. Offset on the Uno Turbo rims is unusual (standard wheels have a cast-in spacer too). Tipo, Punto, and Strada can fit with spacers. Poorly maintained handbrake cable-to-rear disc calipers is similar to the X1/9 design. It needs annually greasing and checking. Neglected rear calipers are prone to seize too! Pedal should be firm - because of the remote bar to the master cylinder on the passenger side - has a little more travel then normal for Fiat. The first thing you need to get used to is the switch layout. The mark one presents you with several lights, main/dip switches etc that appear to work upside down. they aren't consistant either, until you work out they are aligned as if your hands are at the 'ten to two' position... nope I've realised even if I explain it you'll still get it the wrong way. And the screen washers work by moving the windscreen wiper switches horizontally in towards the steering. OK the standard steering wheel is too big, I'd stow it for a 13 inch the car needs flicking sometimes. Looking around the controls - the large throttle pedal is there for heel towing, if a bit too low.... brakes have more travel than usual for Fiats, and the remote linkage on the gears feels a bit sloppy so changes will need to be precise. All the decor and instruments are better but there's no disguising the fact I'm in an Uno. Fire up - the noise and vibration is familiar and intimate. Lots of lights go out on the dash.... I select gear and away we go. The turbo is there from 2500 singing away behind the engine noise, and it digs you without lag. New drivers get a shock, for the turbo suddenly demands more accuracy and attention from you. There's a Jekel and Hyde touch to the controls, the steering and throttle are sharp but the brakes and gear shift blunt. With the car on one bar boost, holding the throttle down launches the car forward. Next gear please it says.... using any more than quarter throttle will interrupt conversation. Two things immediately dawn.... there is no turbo lag ...this set up delivers torque instantly, secondly, as the patched roads and grid irons arrive, you are reminded how light this car is. Into third now I'm going to provide more than half throttle and the car takes off. Yes there is instant boost, but I notice it also takes a bit of time to build boost now.... a glance in the mirror reveals... nothing... the cars behind have disappeared. The connection between the engine and the road feels so direct. I'm riding a pocket rocket. 50 aspect ratio tyres transform this connection - showing that the tyre walls provide a lot of the response in the corners... so choose your tyres well. And here is the first trap for the unwary. A lot of the cars poise through fast corners is provided by the driver - positioning and steering input for sure - but also throttle control. The car's understeer is balance and controlled by use of the throttle. To be driven near its limit through corners means the driver work! Because the car is so light, cambers and surface changes combine with that all important throttle injection to keep you busy. Having said that most cars couldn't corner at this speed. If you understand the black art of left foot braking, this car can use it. If you like one finger steering, and the badges to go shopping in .... this car is not for you. If you want to know why Abarth's modded little Fiats were mythical to Italians.... here is the reason again. What's the second trap for the unwary? Well at one bar you will find yourself travelling at ludicrous speeds and the brakes are lets say marginal. So you have to check those braking zones constantly, or else! What sorts of power and performance can you expect? Here we are going to focus on the initial steps of tuning to bring the cars up to around 130 - 140bhp at the flywheel. Beyond this point tuning becomes increasingly expensive, and it is recommended that you try cars with this level of performance before considering moving on and up the tuning ladder. Because of its light weight, a well sorted and lightened Uno with 135bhp will have a top speed around 140mph and a 0-60 time around 6.5 seconds. After this point diminishing returns set in – remember we are dealing with a 1300cc engine – and a small volume turbo. Its single overhead cam head has reasonably shaped chambers and relatively large valves to begin with. So additional modifications to get beyond 150bhp become increasingly drastic and expensive. A well tuned road car can deliver 180-190bhp but the engine will need to be completely rebuilt – pistons, head, large turbo, intercooler, engine management, injection system, fuel system, clutch, and gearbox. What’s the max power limit? Well around 225bhp DIN, using the Punto GT (same SOHC engine design) and its six speed box. But above 190bhp the engines become increasingly temperamental. At 220bhp, because the engine stops flowing any more air, increasing the turbo size/ boost just raises temperatures to the point where everything important starts melting. You will also be sacrificing all the mid range torque for a very narrow power band. OK for sprints and drag races, but turbo lag kills the fun almost anywhere else. Some enterprising SFC members have looked at using the new 16-valve 1242cc head as a basis for tuning. 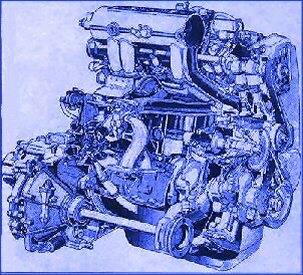 In fact the 8-valve and early 16-valve Fiat twin cam engines share a common design background with the SOHC engine and offer a better tuning route for the adventurous or over-wealthy. The Strada 1500 gearbox on the Mark 1 Uno and the early Tipo box on the Mark 2 Uno are good for about twice the torque originally intended. Again around 150bhp at the flywheel – after this you will need to be gentle or go for the more expensive competition derived alternatives. There are many Italian alternatives. If you transplant into the Uno please remember to retain the equal length drive/ intermediate shaft style of layout in the original. This design does a lot to reduce torque-steer. The Uno Turbo Strada box is the most advanced of the standard range – in particular with its use of ball race bearings where previous versions had solid ones. So easy swaps are not available. You must improve the braking and handling of the standard car before tuning the engine. The brakes and suspension set up – even when new – are marginal to the car’s standard performance. Upgrade them first. Although the Uno arrived in the middle of the “Hot Hatch Era that was the Eighties” – it was in fact de-tuned for production. You can’t say that about any of its rivals now can you! The story goes like this… IHI-Warner of Japan were commissioned by Fiat to design the turbo engine for the Uno, while Fiat/Abarth got on with designing the car. IHI’s experience with the Uno and Fiat was small, and Fiat’s experience of turbo road car solutions was also limited. The engine package was finished first, apart from the Marelli/Bosch engine management & ignition solution. Eventually the system spec was built around a nominal 1bar turbo boost pressure. When the prototypes were assembled it was clear the whole thing worked very well. Now we don’t know whether it was the risk of needing to extract grannies from tree tops (who’s only sin was to sneeze hard while driving their Uno T). Or the likelihood of successive layers of Uno Ts piling up outside difficult bends. Or component longevity in the face of poor fuel quality and indifferent servicing from mechanics. Or the difficulty in selling more expensive performance Fiat/Lancias if the cheapest in the hot hatch range comprehensively blew them all into oblivion. The precise reasons are shrouded in Fiat mists. Suffice to say it was decided to reduce the performance of the Uno Turbo for production. And the cheapest way to do this was to lower the boost pressure to 0.6bar. What you have available then is an engine/turbo basically engineered for 1bar operation, but operating at 0.6bar boost. We are going to discuss the ways of safely and reliably putting this back to 1bar. The Uno Turbo suspension is common to both Mark 1 and Mark 2 cars. The general layout will be familiar to Punto and Cinq/Seicento owners too. In the case of the Uno Turbos the rear brakes are disc rather than drum based. The Uno uses MacPherson struts at the front and rear. The front struts have a cone shaped coil spring slightly offset to provide more stability under heavy braking. The rear suspension is mounted on an ‘H’shaped beam axle connected to the body at its front ends from which it can pivot. The shock absorbers are connected to their top mounts at the axle line, but the coil springs are located forward of this point on the beam arms towards the front pivot points. There is an anti-roll bar at the front of the cars, routed around the back of the engine bay, and located on the bottom of the front bulkhead. Lowering:- How low can I go? Well the Uno is high as standard and its possible to go down by a ridiculous 100mm at the back and about 60mm at the front, and still get 15 inch rims on (with 45 profile tyres). But at this level the car will drive like a manic go cart - skipping around over the slightest uneven surface and you’ll find most of the interior on the floor. No fun to try and drive it in a straight line at all. The car may look cool, but you won’t. At 35mm – 40mm lower front and back you’ll still have some suspension travel left and the car will stop and corner to match its performance. At -40mm the front valence will still hit a house brick laid flat on the road – and you should note the intercooler and oil cooler are just behind that valence! Strut Braces: These bolt across the suspension turrets and do stiffen up the chassis – especially the rear one that can also pass as a luggage restraint for the boot space. OMP do a front one for £50 and a rear for £20, but Eibach and Momo used to stock them as well. The Momo Italian front version was routed around the back of the engine bay (rather than straight across between the top mounts) and doesn’t get in the way as much. Springs: Available in different heights from standard, usually between 20 and 60mm. Obviously the spring rate will be much higher for the shorter springs. Consider going to coil over set ups, with adjustable spring platforms straight away. As the standard conical shaped front springs are expensive – so switching to standard size and shape springs is cheeper. Spring choice includes Eibach, Pi, Chassis Dynamics (Avo) and many others (see below). Spax and Avo do 35mm lower spring sets. They both improved handling without sacrificing too much quality, about £80 - £100 for the Uno T. Please don’t try chopping standard springs! It is an MoT failure point, and puts too much strain on the remaining standard springs. They are now also at the wrong rate for the height. If the ride feels too harsh then Jamex and Eibach provide rising rate springs – but they are more expensive. Shockers: Match with the springs and buy as one package to get the best results. Then your new shorter springs won’t fall out at full extension (another MOT failure). Koni, Avo, and Leda make decent adjustable sets, for track days the Konis are probably better. Italian options will relieve you of more money. Expect to spend about £400-500 and don’t skimp on cheap sets that can’t last or perform (see table below). Bushes: Do replace all the suspension bushes. Its possible your Uno still has original bushes - probably like marshmallow now. So change for new or preferably uprated ones. Stiffer springs and shocks will put more strain on the bushes. A combination of Superflex, Truflex, Powerflex and Proflex are available to kit out your Uno T. Don’t neglect the anti roll bar bushes either. Anti-roll bars: The standard one is OK. In fact for near the limit driving the Uno could do with a bit less understeer – and this would suggest stiffening up the rear suspension against roll rather than the front. Eibach make stiffer ones for about £150 but this isn’t really necessary until all else is re-newed. Do uprate the front anti roll bar bushes and rear axle pivot bushes – this is to provide more accurate alignment under fast cornering rather than cause any changes to the car's handling. Brakes: The Uno will benefit from larger front brakes and callipers. This will often mean adopting 4 pot calliper systems. In this case, to avoid much longer pedal travel, change the size of master cylinder at the same time.The master cylinder is located on the passenger side of the engine bay, operated by a remote bar so the exhaust manifold cannot contact it in the event of rearward engine movement. A bigger brake disc may also mean increasing the wheel diameter to 15 inches too. 14inch and 15 inch wheels from the Strada Tipo and Lancia ranges will fit – with spacers – as the Uno offset is different. All Fiat Lancia and Alfas have the same (unique to Italian cars) bolt centres. But to use most of these wheels you’ll need to look at converting from bolts to nuts to secure the wheels. The choice is yours! Step 1 Look to lighten the load of the engine brakes and suspension by reducing the weight you’re carrying. Choose light weight options (starting with wheels, and exhausts), be generally aware of how much weight you are saving or introducing with all your choices. Much of the performance advantage of the Uno comes from its relatively light weight. Keep it down! Step 2 Induction – cold air is best and the engine bay is very congested. So start by moving the battery to the boot in a battery box. You can have the spare wheel compartment modified to fully fix the battery/box in place. This allows you to box off the old battery area with aluminium sheet so it gets cold air from the headlight area in front. Into this you can place a large cone filter for the air intake. K&N and Pipercross can supply the filter. Make sure the 'boxed volume' is atleast six times the volume of the filter cone itself. Step 3 Wastegates - The air then flows via the turbo into the engine. A wastegate controls the boost level and on the Uno is not adjustable. This is were we have more than one option, and there is some debate over the best way to go within the club. To increase boost we can fit a bleed valve between the turbo compressor housing and the wastegate. Use either two or three way valves. The 2 way bleed valves are simpler whereas the 3 way ones can bleed off air. This can affect the turbine blades in our small turbo for both better and worse, sometimes causing stall and jiggle at the wrong moment – that’s why there’s a debate. 2 way valves are OK. Step 4 The Intercooler – optional to begin with, is a change of intercooler. The Uno’s is tough but small. The Mk 2 has a slightly larger one, but neither gets a lot of cooling airflow in their positions. The next size up would be the Delta 4WD version - costs about £40 second hand – exactly twice the size of the Mk1 standard intercooler. It's easier to fit using its own mounts from the donor car. About twice the size again would be a Cosworth (that's 4 times the Mk1) – an early Sierra Cossie will cost about £60 second hand - and make sure it doesn’t leak! The Cossie at four times the Uno’s size is difficult to fit – and increases the circuit travelled by the air. Try and keep the intercooler as small as possible for your particular uses/ temparatures. Spray systems onto the intercooler can help too. Try a big reservoir in the boot area. Screen washer pumps are fine - use lawn sprinklers with adjustable fine jets from a DIY superstore. Trigger and switch from the EMU. Step 4 Dump valves – if you insist on changing the dump valve for its noise try a Bailey twin piston dump valve. This goes TISHH and doesn't seem to cause too many other problems. I prefer to keep the short little cha-cha-cha-chat heard from the standard one at 1bar boost (providing its working alright). Step 5 a) Now the main mods for ‘stage one’ can begin. Your engine and clutch have to be in reasonable condition. Also check you are getting full throttle by having someone press down the accelerator, and observe that the plenum butterfly is fully open. There's no point in tuning the car if you aren't getting full throttle and more than half the cars I see have stretched throttle cables so replace it! Now on the side of the Plenum Chamber is a pressure cut out switch. The standard cut out operates at 0.86bar. And it loses accuracy as it ages – cutting at lower pressures. So the switch terminals must be electrically isolated. Detach it and make sure the terminals are secured completely electrically isolated (very taped up). Step 5 b) If in doubt go to someone who knows what they are doing! Next there are adjustment screws on the Marelli engine management box to close the tolerances (gain) on its outputs. These are further closed. The fixed map of the system is valid up to about 0.9-1bar boost. Smooth running and timing has to be checked. Step 5 c) On the end of the fuel rail is the standard fuel pressure regulator, it must be in excellent condition, along with the fuel pump and injectors. We have heard of problems replacing this with a ‘rising rate’ regulator – that effectively increases both the fuel flow & pressure with increased fuel demand. The FSE Power Boost Valve is one of these. But it is easy to swamp the Uno’s fuel system, so although this product can increase the fueling rate from 1:1 to 1:7, a maximum of 1:3 is about the limit for an Uno. A power valve like this is designed to combat the dangers of the mixture leaning out at high revs – by ‘throwing’ more fuel through the injectors from increased fuel pressure. If it works, we are dumping a not very accurate amount more fuel into the engine at any high fuel usage point. The rest of the rev range will suffer from an over rich mixture, including at idle, if the pressure is no longer normal. As a result your engine’s fuel metering can be way out! On the Uno there is no mechanism to compensate - so this can result in really rough running. Step 5 d) You must only use Super Unleaded (that’s 97 Octane – not anything else). It is advisable to use an octane booster as well. Millers and Castrol are two amongst the good ones. Step 5 e) Spark Plugs – after quite a bit of testing on different cars, we think the NGK triple electrode plugs suit the Uno Turbos well – both for power, smoothness and emissions. Unfortunately you can’t get the right grades etc from Halfords. (See the alternative suppliers table below). Step 6 Head Cams & Gaskets – the combustion chamber shape is ok for this level tuning. Providing the engine is in good condition (the valves and piston rings should be ok for 90,000 miles if the engine has been well maintained.) The Fiat head gaskets will be fine for up to a 1bar boost. On changing the gasket make sure new stretch bolts etc are used. The cast iron valve guides will wear around 100-120,000 miles budget for a head re-build then. This is a good time to look at gas flowing the head around the valve stems, and shaping the ports. The Mk1 head has bigger inlet valves. But the Mk2 camshaft and then the Punto GT camshaft provide further performance gains before resorting to high lift cam solutions. Step 7 Exhaust System – Is heavy and restrictive. If you want maximum power though forget the fashions for massive bore exhausts. The engine is too small to tolerate it without big power losses. For cars delivering under 150bhp use an exhaust bore the same or very slightly larger than the manifold bore – just over 2.2 inches. Over this power output a bore of 2.5 inches is about it - i.e. for race applications. Choose single box systems with short tail pipes. The tails pipe bore should not be more than 0.5 of an inch wider then the main bore. Any bigger and you will start to lose performance - you have been warned! Powerflow or Longlife, with outlets all over the country will make you up a stainless steel exhaust for around £300. OMP do one with no silencer! Why does their performance vary so much? What's the difference between the Mk1 engine management versions? IHI made serious moves towards private car turbos from the late seventies. This was confirmed with a joint venture Borg Warner Automotive in America in 1980 when IHI Turbo America (ITA) was founded as the Warner-Ishi Corporation. This venture was granted licenses to market IHI turbocharger technology and is part of a worldwide turbocharger supply network, including IHI in Asia, IHI Turbo Italy and Germany. From 1986, Warner-Ishi manufactured the RHB5 turbochargers at Shelbyville, IL primarily as a supplier to Ford but including GM, Fiat, Renault, Kohler, Generac, and VM Motori. In 1998, IHI purchased Borg Warner Automotive shares in the company to become 100% owner and the company was re-named as IHI Turbo America. ITA continues to be a major supplier of turbocharger products in North America and is part of a global network serving the worlds engine manufacturers. This network includes IHI, ITA, ICSI Italy and ICSI Germany. ITA continues to provide the highest technology turbocharger products available in the world today by application of IHI technological developments. These developments include VGS (Variable Geometry System), ceramic and mixed flow turbine wheels, ball bearings, noise and vibration control, inducer treatment and many others. The IHI company web site is at www.ihi.co.jp . In 1936 a young Cliff Garrett formed his company in a one-room office in Los Angeles. With encouragement and financial support from friends like Jack Northrop and Harry Wetzel, plus $5,000 he borrowed on his own, Garrett founded the company that would later become the Garrett Corporation. SInce then, the growth in the use of forced induction has seen the Garrett Corporation expand consistently until it has over 6,000 employees and a range of products used by all the world's major engine and vehicle manufacturers - including Audi, BMW, DaimlerChrysler, DDC, Fiat, Ford, International Truck Co, Peugeot, Renault, Saab and Volkswagen. Trevor's exploits in a close cousin to the Uno T - the Lancia Y10. Desira Parts Force quote your membership number for the club discount. Body panels, suspension and mechanical items have been supplied to the club over many years. Based in Norfolk, you are after the Fiat obsolete parts section. Try the general parts guys on 01379 650131. Located within the M25 (just) Recambio can often help with OEM suppliers. Brakes International for brake calipers (new and on exchange basis) and brake components. On line purchase possible. based in Rochdale. GGB engineering are a good starting point for brakes, pipes, stays struts and bushes - and they are still specialist Fiat and Alfa motor factors. I'll have to check if their outlet in White Hart Lane still exists (now in Bradford). Used to stock a range of tuning parts too. Comprehensive body kits and engine conversions and everything in between. Hörmann Motorsport Kempten (Germany) may still stock their Uno body kits. The list of parts for the Uno being stocked by these suppliers is steadily declining. But some are still available.